Queen Valeria Messalina, Empress Consort of Roman Empire was the notoriously famous wife of Emperor Claudius. British compared the Queen of Punjab with her. Although the queen of Punjab and the Queen of Rome had nothing in common, the informal title given by the British exhibited, how they trapped the Queen and tried to spoil her royal and clean image, so they could rule Punjab. Shah Muhammada jaan 50 barsa, changa rajj ke raaj kamaye gaya. British were not able to win Punjab. So they decided to sign a treaty with Maharaja Ranjit Singh. According to this treaty, they will keep trade relations with Punjab and provide protection to Punjab. And in case of Maharaja’s demise, his sons will be legal heir. But if there is no heir left, the British will take over. The seed to the conspiracy was set. Maharaja Ranjit Singh himself died in mysterious circumstances. When Maharaja Duleep Singh acceded the throne, the Anglo-Sikh war broke out. It started as a small mutiny between Sikh forces, which was aired by the British. After the British had bribed some chiefs and nobles in Sikh army, they entered into the battle field. Long story cut short, the end result was that by December 1846, Maharaja Duleep Singh was taken away for hunting and then never returned Lahore. When Maharani Jind Kaur tried to inquire about his son, her brother told her that the British had taken him for hunting. She got little scared by this and tried to get deeper into the matter. Her brother, who was also a noble and loyal to the throne of Punjab told her, “Sister, Duleep has been taken by British. It is possible that you will never see his face again. I couldn’t do anything. They are now coming for you”. Means: When Jind Kaur was being taken away, she heard someone from heaven. The voice said that you shall now never return to Lahore. You were queen of this fort, but you shall never lay step back in here. You should remove this royal crown from your head, as you shall no longer be called a Queen. The real torture for her had just began. She must have been cursing herself for not attempting ‘Sati’ with her husband, like other queens of Maharaja Ranjit Singh. Today, when she opened her eyes after a long night of unconsciousness, she found herself in a prison. British had imposed serious charges against her and proved in the Sikh Court of Punjab that Maharani Jind Kaur is the mastermind behind the mutiny and which led to financial and life losses. And since she was already kidnapped and imprisoned, she could not appear before the Khalsa Durbar to prove her innocence. Many wazirs of the Khalsa durbar had already sold themselves to the British. Hence, the resolution was passed declaring Queen Jinda’n as guilty. British were waiting for this day. They declared the imprisonment of Jind Kaur. First she was kept under house arrest for 10 days in the Samman Burj of Lahore Fort. Then she was moved to Sheikhupura Fort. Then there were other incidents of Mutiny, which were all blamed on Maharani Jind Kaur in prison. British proved that while she is under tight security and under heavy watch, she is still having contact with her loyal nobles and must be taken away from Punjab so that the region can be in peace. Hence, she was taken to Chunar, 45 Kms away from Varanasi. This fort was used by British for political prisoners and it was said that no one left this fort alive. Means: I, the queen of Punjab. Look at me now. I used to donate pearls but today, I don’t even have food to eat. The British had raised an alarm of prisoner escape. Search parties started looking for her. Somehow, these two ladies started running towards Nepal. The king of Nepal, Shri Teen Maharaja, Jung Bahadur Rana used to be in the court of Maharaja Ranjit Singh along with his maternal uncle, when he was young. Jind Kaur was sure that Jung Bahadur will definitely help her in this state, when entire India is against her. Going to Nepal, some police agent started following them and when he realized who they are, he reported them to police. But they were able to escape that situation also. Their days started with begging for food and passed walking village to village, hiding and trying to reach Nepal. Their nights were spent under open sky, without any warm cloth. This was the state of one of the most powerful Queen’s of India. That night, the cave was filled with emotions and painful memories of Lahore. Next day morning, these three disguised as Saadhu and Saadhvis and started their journey to Kathmandu. Little far from Kathmandu, the Sadhu got sikh with double pneumonia and died on the spot. Bot these ladies started crying on her body as he was their last hope to reach to Kathmandu. Suddenly, a cavalry unit reached there and asked them what happened. Jind Kaur recognized the soldier’s uniform and told them everything. The soldier were guards of Maharana Jung Bahadur, who was hunting in that forest. When news reached him, he sent for a palaki and Jind Kaur, who was living as a beggar for many months now, once again sat in the royal palaki to reach the tents of Maharana. 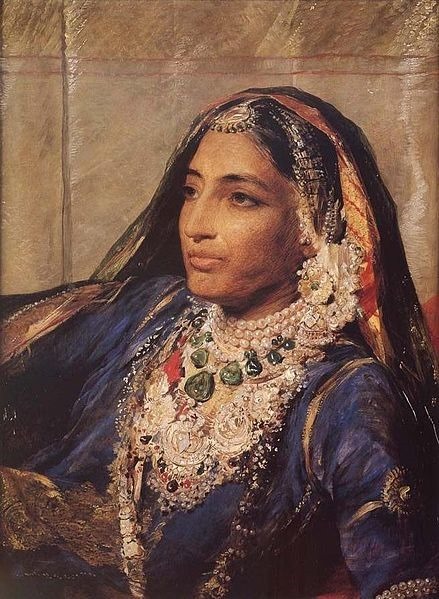 Though being the Queen of Punjab, she fell in the feet of Maharana and begged for shelter. Maharana Jung Bahadur got very emotional and built her a small refuge-palace next to river Vishnumati. She spent next 11 years in this palace, hiding from the outer world. During this period, she lost her eyesight because of crying. Meanwhile, Maharaja Duleep Singh had turned into a Christian. When he was taken from Lahore, his hair were cut and packed in a golden box and sent to Queen Victoria, saying that we have removed Sikhs from Punjab and now entire India is ours. He was then put under the care of Dr. John Login, who converted him to Christianity at his exile palace ‘Fatehgarh’. The then Gov. Gen. Lord Dulhousie then sent him to England in 1854. He was exposed to British Literature only and he never read about Punjab. But after 1857’s mutiny, his pension was reduced and several restrictions were imposed on him. He met one person from Surat, who was working in his residence at Reohampton. There he learned about his origin and him being a Sikh. He also learned that he was the rightful heir to Maharaja Ranjit Singh. He then planned a journey to Calcutta. He learned that his mother is still alive and some Sikh soldier know where she is. He wrote a letter to her and which reached her after 1 year. When the letter was read to Jind Kaur, she became emotional and asked Maharana Jung Bahadur for permission to meet her son. Rana said that if she leaves Nepal, everyone will come to know that she was hiding here and it will become a risk for him. So she will have to slip away secretly and never to return to Nepal. She agreed and left Nepal forever, to meet her son Duleep Singh in Spence’s hotel in Calcutta. Duleep Singh tried very hard to get her body to Lahore. Till 1864, her body was kept in Dissenters’ Chapel in Kensal Green Cemetery. When Duleep got permission, he hurriedly brought the body to Bombay, from where he had arranged for the travel to Lahore for cremation. But when his ship reached the dock, he was handed over the letter from Queen Victoria, stating that he should cremate his mother in Bombay only and return to England immediately. He cremated his mother at Panchvati, near Godavari River. Later, his daughter Princess Bamba visited the place in 1924 and arranged for the remains to be shifted to Lahore as per her last wish. Her remains now rest in Lahore next to her husband. Her son, the last Maharaja of Punjab, died as a Christian in France on 22 October, 1893. Punjab was later divided between Pakistan and India.